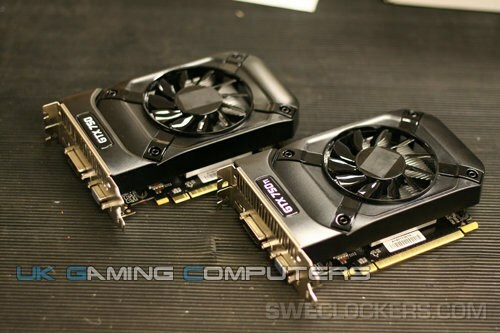 TPU came across a photo of a GeForce GTX 750 Ti and GTX 750 from Palit and Galaxy. These cards are based on the new GM107 GPU, the main difference between the cards are the number of CUDA cores and the clockspeeds, as well as the standard memory amount: the regular version has 1GB GDDR5 while the Ti model has 2GB. The GTX 750 Ti features 1085 MHz core, 1163 MHz GPU Boost, and 5.50 GHz (GDDR5-effective) memory, which churns out 88 GB/s of memory bandwidth. The GTX 750, on the other hand, features the same GPU clock speeds, but slightly slower memory, at 5.10 GHz, at which the memory bandwidth is 81 GB/s. The site also put the two through a quick 3DMark 11 run (performance preset). The GTX 750 Ti scored P5963 points, and the GTX 750 scored P5250 points. Since the two are custom design cards, we're not sure if the clock speeds will stick. For all we know, the two could be factory-overclocked. Impressive performance nonetheless.